Modern cruise ships, as we all know, are massive floating resorts with all the conveniences and luxuries we would expect to find in their terra firma counterparts. Swimming pools, restaurants, spas, bars, gyms, specialty shops and discos are all taken for granted. But how does a cruise line further differentiate their offering without building an entirely separate ship? Enter the ship-within-a-ship. This creative and intelligent concept is really just a further development of the old first class/second class/tourist class partitioning once found on liners going back to the Titanic. 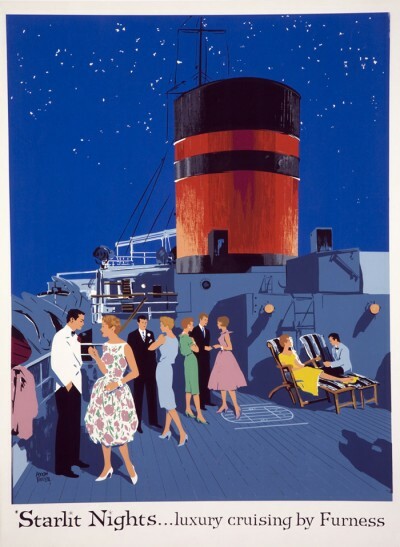 Cruise ships gradually dissolved this elitist class structure and simply offered different cabin sizes and locations within the ship, with the rest of the facilities equally accessible to all. It gives a kind of ‘small ship’, exclusive atmosphere on an otherwise gargantuan vessel. Now things seem to have gone full circle and cruise lines are again experimenting with private ‘club’ facilities limited to a premium slice of the passengers. Commercially it makes sense, as cruise lines are able to apply premium pricing to these sections of the vessel with minimal disruption to the other workings and retaining their normal ‘family-friendly’ pricing and deep discounts elsewhere. Here’s a quick look at some major cruise lines who are working this new angle. Introduced on the massive Project Breakaway vessels (Norwegian Breakaway and Getaway under construction) in 2011, ‘The Haven’ offers an array of amenities, including private butler and concierge service. "Norwegian was the first cruise line to introduce the ship within a ship complex with the introduction of Norwegian Jewel in 2005," said Kevin Sheehan, Norwegian's chief executive officer. "These private enclaves at the top of the ships are home to our most luxurious, well-appointed and spacious accommodations offering the utmost in service and elegance. With the introduction of the suite complex on our Breakaway ships, we felt it was appropriate to brand this space as The Haven by Norwegian to better identify and describe the unique luxury cruising experience we offer." On the Project Breakaway ships, The Haven, consisting of 42 suites located on Decks 15 and 16 forward, includes a private restaurant, a cocktail bar and a concierge desk where Haven guests can relax, have a drink and make dining, entertainment or spa reservations through the dedicated concierge. In the centre of The Haven, there is a two-story courtyard area with pool that has a deep end for swimming and a shallow area for relaxing, two whirlpools and a private sundeck, along with two private massage rooms, changing areas and a sauna. The Haven guests also have direct, private access to the ship's spa and fitness centre. The most luxurious and the largest suites within The Haven are the two Deluxe Owner's Suites which include an elegantly appointed living room and dining area that also includes a wet bar. In the bedroom, there is a plush king size bed with pillow top mattress that faces floor-to-ceiling windows and an extra-spacious wraparound private balcony. In the bathroom, there is an oversized bath tub, two modern vanity sinks and a luxury shower. The Deluxe Owner's Suites can be joined to the Owner's Suites, creating one grand suite that can sleep up to eight guests. As you’d expect from a cruise line with this sort of pedigree and used to transporting members of the royal family, Cunard’s elite category on their ocean and cruise liners set the benchmark for premium cruise offerings. The Grill tradition dates back to 1936, when guests on the original Queen Mary paid an extra tariff for an evening of dining and dancing in the sophisticated Verandah Grills. It proved so popular that Queen Elizabeth 2 (launched 1967) continued this concept with her Grill Room. In the early 1970s, the extra tariff ended, with guests travelling in deluxe staterooms enjoying the Grills Experience and the highest quality of food in the Grills restaurants. On Cunard’s true ocean liner, Queen Mary 2, experiencing the Grills is to indulge in the very finest interpretation of life aboard. Begin with priority check-in and embarkation, followed by your intimate restaurant and sumptuous accommodation with private balcony - the most luxurious on board. You’ll find this ship-within-a-ship concept on MSC Fantasia, MSC Splendida, MSC Divina and MSC Preziosa. Called the MSC Yacht Club, guests are greeted in an opulent Concierge reception area and enjoy an exclusive lounge, pool and bar area, plus a dedicated restaurant as well as private access to the MSC Aurea Spa. MSC Yacht Club also offers complimentary wines and spirits, signature Butler service and gourmet delights. Within the MSC Yacht Club there are three grades of suite: Royal, Executive and Deluxe, with the Executive suite family-friendly. All MSC Yacht Club Suites feature 24-hour Butler service; Concierge services round-the-clock; suite amenities which include fine wood finishes, European king bed convertible to two single beds, memory foam mattress, Egyptian cotton sheets, extensive pillow menu, walk-in closet with safe, marble bathrooms featuring tub with shower and hair dryer, courtesy use of luxury MSC Yacht Club bathrobes and slippers, complimentary en suite mini-bar, 24-hour room service, television, Nintendo Wii console, choice of daily newspaper in its original format, Internet connection and direct-dial telephone (which attracts additional fees). These premium staterooms are designed for the ultimate spa enthusiast. They are double occupancy and located high above the rest of the rabble below, close to the AquaSpa® by Elemis®, creating a cosy community of spa worshippers. Guests enjoy unlimited access to the AquaSpa Relaxation Room and the Persian Garden, just down the hall. As with other cruise lines’s premium class, there’s a dedicated private restaurant, Blu, featuring what RCCL call “clean cuisine”. They claim you’d never guess was good for you. The suites reflect this spa heaven theme with plentiful in-room amenities, including Hansgrohe® shower panels, aroma scent selections, a pillow menu, and daily deliveries of bottled water and teas. Sure, it’s a cliché, but if you don’t think so, who does. These upper class areas aren’t just for snobs and the well-heeled. Consider a segregated suite for a honeymoon, anniversary, birthday or, heck, any other reason worth celebrating. You may never cruise ‘ordinary’ again.